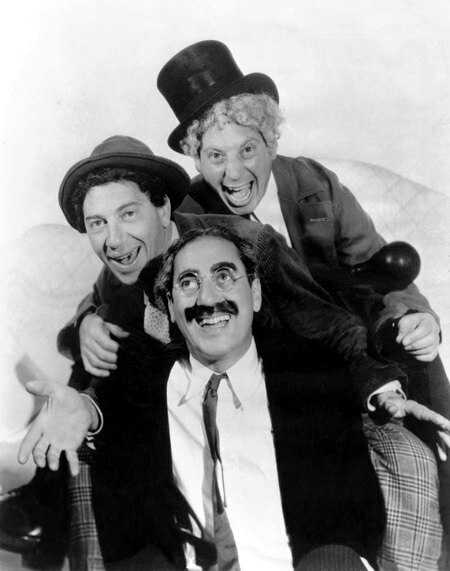 Possibly the funniest brothers to ever tread the Vaudeville stage, the Marx Brothers are American Icons. Even Harpo gets laughs on the Radio! 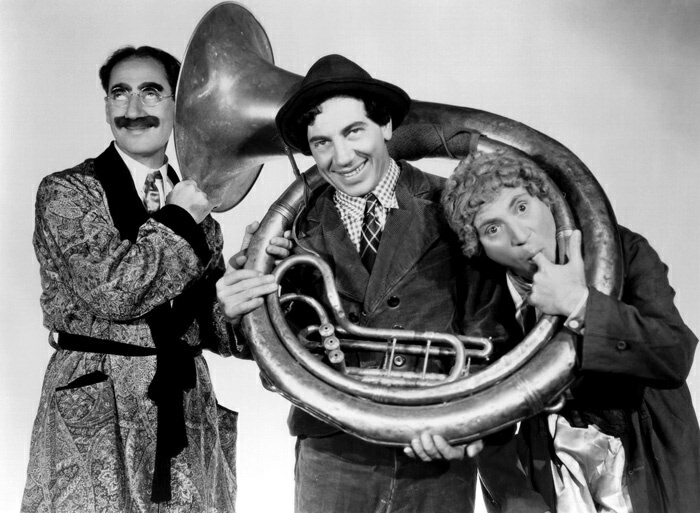 The Marx Brothers used radio as an adjunct to their blossoming movie career. The Brothers came roaring out of vaudeville with a combination of sight gags and wacky wordplay that more than filled the silver screen. Nat Perrin headed a great comedy writing team gave them scripts that made up for the lack of visuals. The Marx Brothers had occasional shows on radio. "Beagle, Shyster and Beagle," then "Flywheel, Shyster, and Flywheel," was about lawyers, of course. Groucho, the "affront" man for the team, played Waldorf T. Beagle, attorney at law, unless he took lunch, at which point he was attorney at lunch. And so on. Chico played Emmanuel Ravelli, Beagle's assistant. Many of the routines from the lawyer show were used in "Duck Soup." Later in 1934, they had a show called the Marx of Time, and Grouch played Ulysses H. Drivel, a reporter. Chico was Penelli. It seems every character Chico played had to end in a vowel. But then, Chico always played it Chico's way. Harpo's career on radio was severely hampered, for obvious reasons. Groucho carried on in radio for years after the Marx Brothers as a special guest artist. He tasted failure once when he lost the chance to do a normal husband role in a series tentatively titled "The Flotsam Family." The producer saw a film actor named William Bendix, retooled the show and called it The Life of Riley. Of course, Groucho, always ready with a good cigar and a better comeback, went on to do "You Bet Your Life" both on radio and TV. Groucho remained a consummate entertainer throughout his long life. The collection also contains interviews and recorded material that gives a inside look at how the Marx Brothers became the ground-breaking, and wall-breaking comedy act of stage, screen and radio. In the Penn and Teller book "How to Play with Your Food," Penn Jillette (who also works with a silent partner) writes, "Etiquette gives cranks the advantage." This is an excellent description of the Marx Brothers modis operandi. Be the first to comment on "Marx Brothers"